So for today’s blog I’m in the province of Murcia in Spain. It’s a large region in the south-east that abounds in amazing produce. So much so that it’s known as the Orchard of Europe. Lucky restaurants, they have the best ingredients to cook with. And it’s on the sea, too, so plenty of fish. I love the Spanish way of eating. Plenty of small, tasty dishes to share – it gives me the chance to try way more of the menu selection. And that’s got to be good. 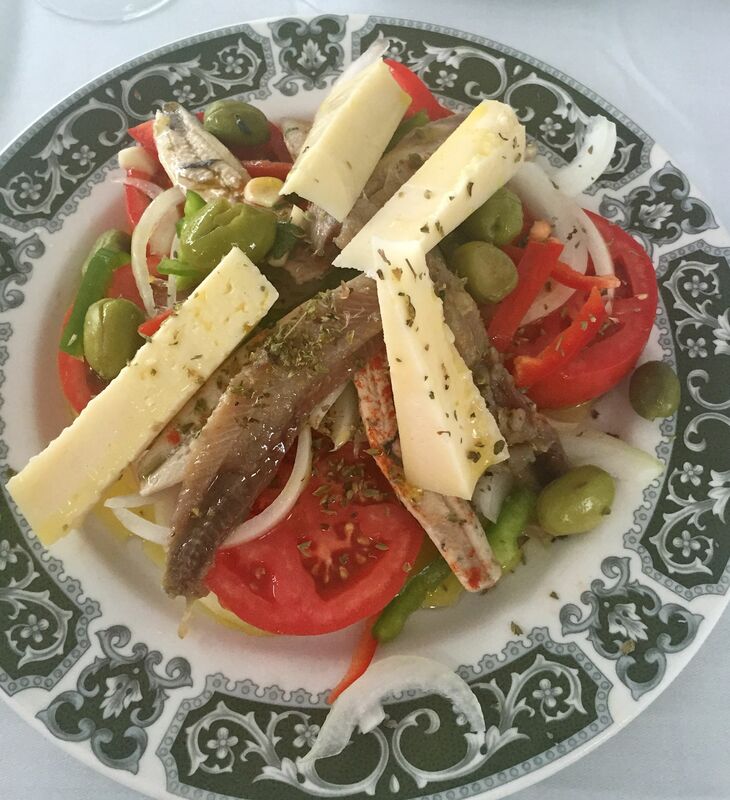 When in Spain, there’s no shortage of traditional bars and restaurants to enjoy amazing food in. 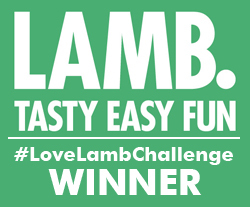 Great, fresh local ingredients, simply cooked and served without pretension all makes for a wonderful experience and usually a great-value one, too. Today we tried something different, as the menu had changed somewhat since our last visit. 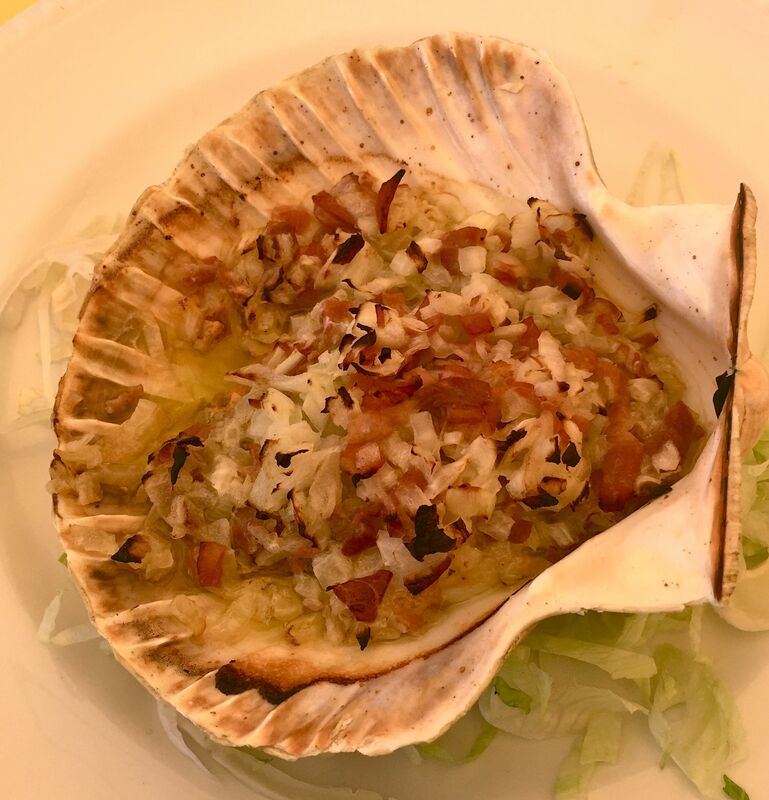 Described as scallop with ham, this large scallop came in the shell served with the sweetest of onion and finely chopped serano ham, which added a sweetness of its own. Just wonderful. Just down the road in this wonderful region of Spain is the La Manga strip. It’s a long piece of land (manga means sleeve in Spanish) that’s a bustling holiday town with plenty of beaches, bars and restaurants. And even better, bars and restaurants that are on the beach. 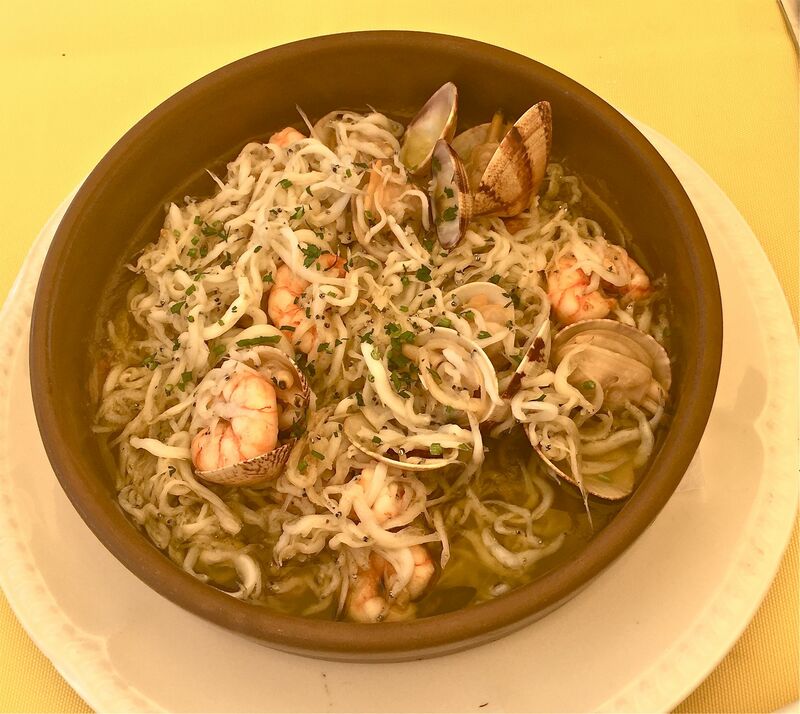 A dip in the warmth of the sea is bound to bring on an appetite, so then it’s the short walk up to Bonobo, our latest discovery. No need for shoes (though you feet may get a little toasted on your short journey along the sand), this beach bar/restaurant is so laid back, but that’s not to say the service and food aren’t up to scratch. 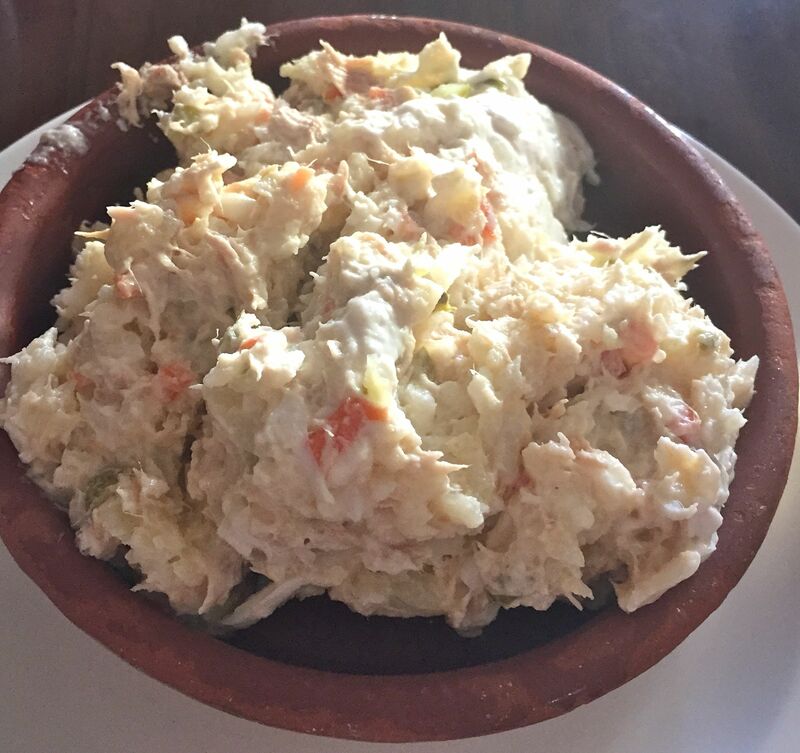 Their house salad is a wonderful concoction of lettuce, tomato, cabbage, asparagus, cucumber and pineapple with a light and sweet dressing. 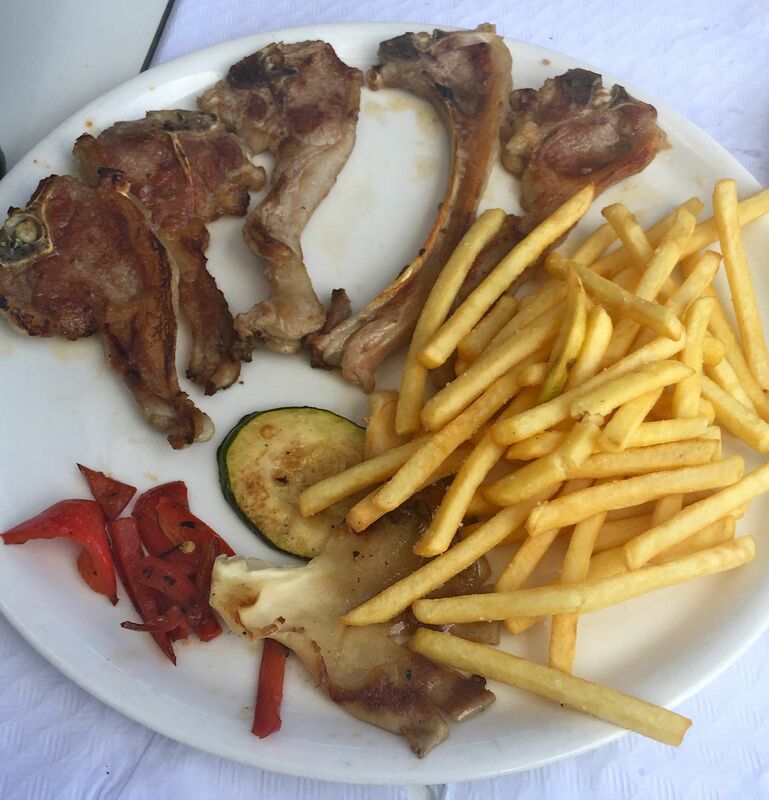 They also serve their version of the tasty baby lamb chops that are abundant in Murcian restaurants. Simply grilled with some grilled veg and light, crispy fries. 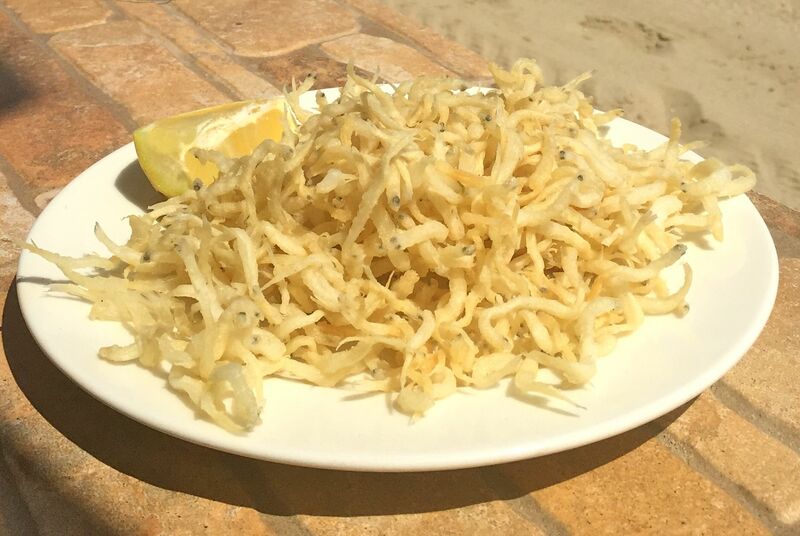 And then, the best of the lot, fried baby whitebait – or small, fried fish as it’s called on the menu. It’s so fresh, crispy and delicious you want to eat it by the handful. And I do! Another favourite port of call is the lovely little town of Mar de Cristal, even the name evokes feelings of pleasure. There’s a large beach and a balmy lagoon to paddle in – and right alongside it sits Arena restaurant. 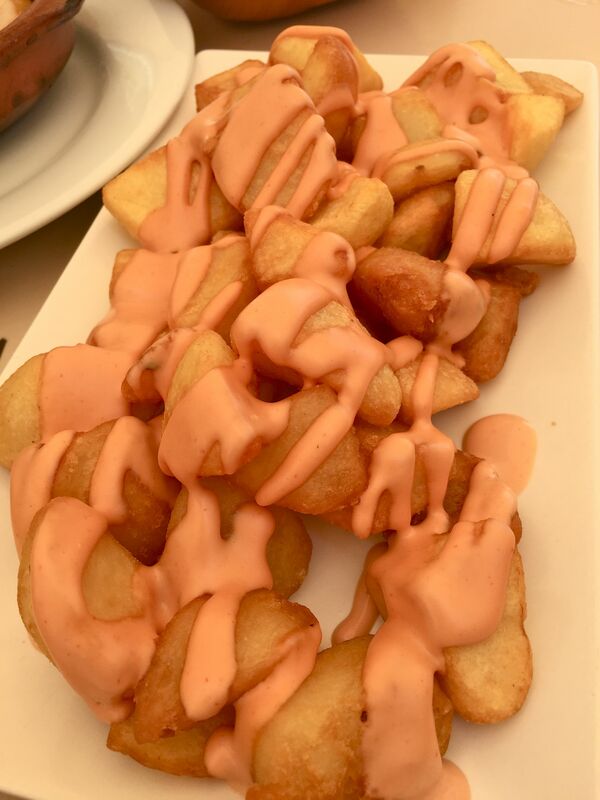 They serve what could be the best patatas bravas in Spain…seriously. Amazingly crispy on the outside, soft inside and served with a mayonnaisy sauce that has a real chilly bite. We also tucked into garlic prawns and chorizo in cider. All overlooking the beach and the blue water of the Mar Menor. A restaurant much frequented by locals is Campo Verde which is kind of on the way to two towns, in the middle of nowhere. Again it’s great value and on Sunday lunchtime bustles with family business from all around. 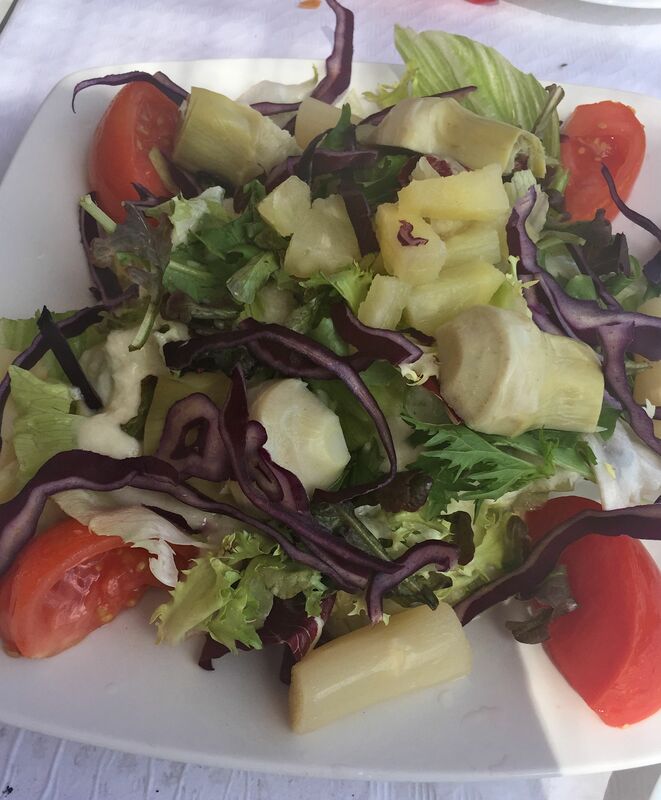 Their house salad makes the ideal starter with the freshest of ingredients, including lovely manchego cheese. And then there are always journeys to be taken inland. The town of La Union, only a short drive from the La Manga Resort is in the centre of the farmlands. It’s quite a big place that has a lovely market (sandwiched by two rotisserie chicken sellers, the aromas certainly get your juices going) every Thursday where you can inhale the Spanishness and take in a nice tapas dish or two. No tourists in sight here. Our lunch in the Taperia Edward which consisted of a pork dish in tomato sauce, Russian salad, a big plate of tasty croquettas and two glasses of wine cost us €11. And it was delicious and certainly substantial enough for three of us. Show me somewhere else you can get lunch for that kind of money these days. La Union we will be back. I love a bit of Russian salad. You can read all about the story of this mysterious dish in a previous post of mine here. And then it’s time to go back to the beach. On the other side of Cabos de Palos harbour to Miramar there’s Katy. Katy has the advantage of being on the beach – a large cove of a beach where we spent time walking, wading and wandering…and sampling a cold cerveza at the chirringuito (beach bar) at the end. And then it was time for lunch. 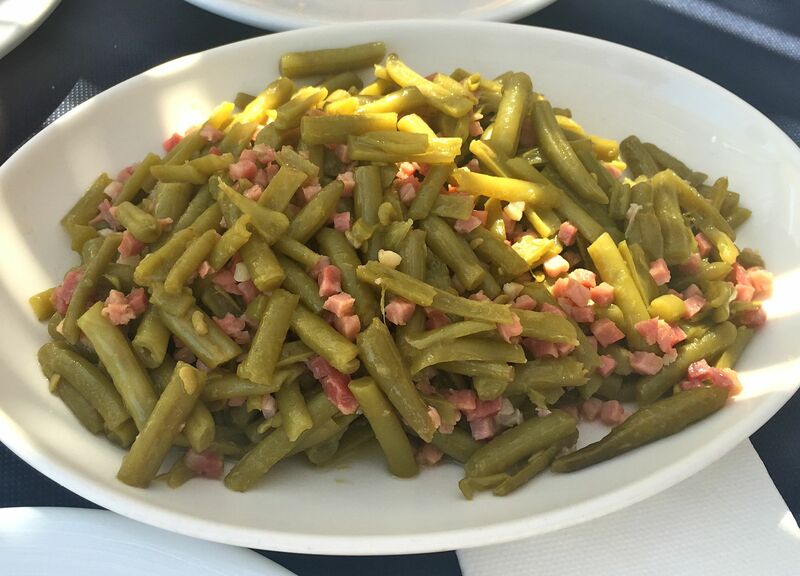 Always keen to try something different, today we went for the green beans and ham as one of our tapas treats. It was huge, piping hot and tasty. 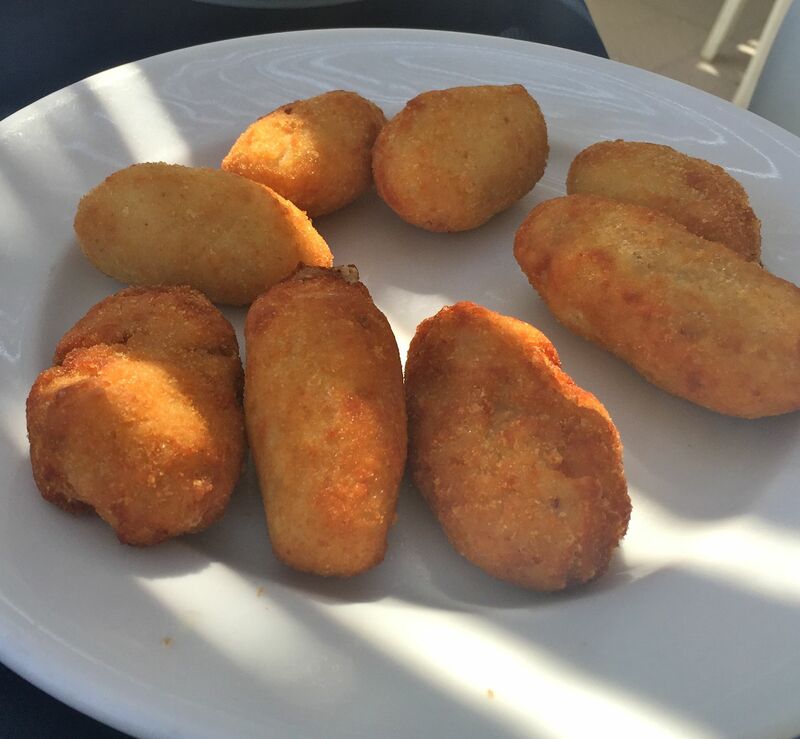 And more piping hot and creamy croquettas to delight. 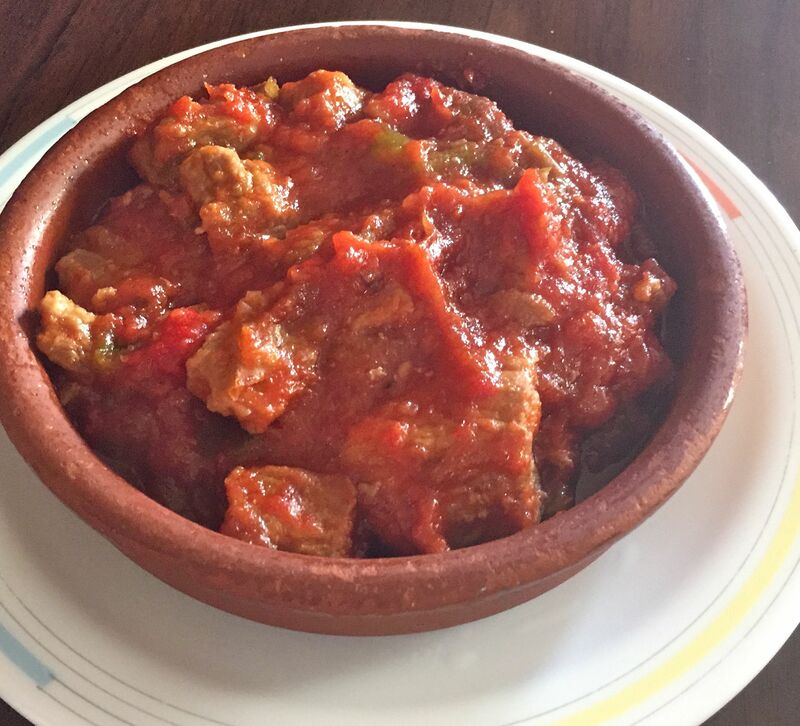 What can I say…Murcian tapas is always a joy. 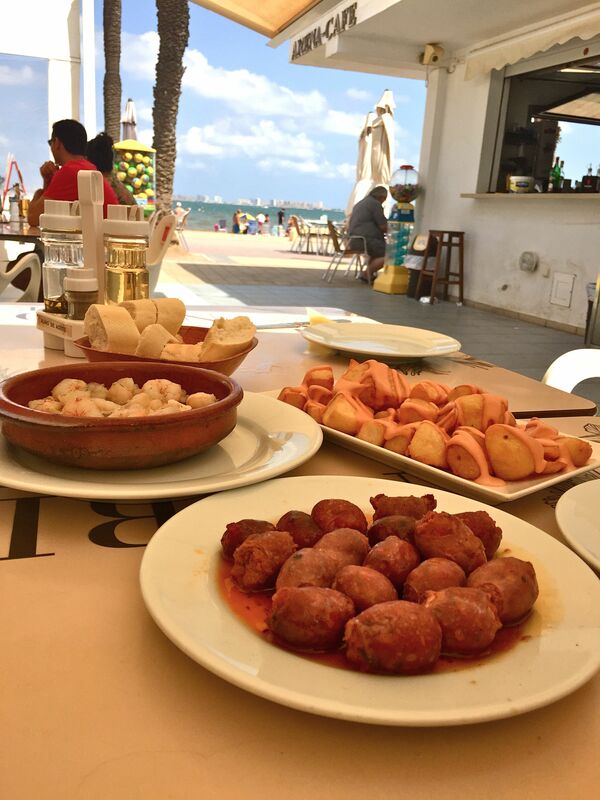 Lunchtime just doesn’t seem the same when you’re not in Spain!